Folks were sleeping in hotel beds while Mary and Joseph walked around. In hopes to return soon to their precious homes. Just minding their own business on this particular day. Were settling in for a long night with no naps. When out in the field there arose such a clatter. The shepherds fell to their knees for a message that would matter. The angel told them to be calm for he had an announcement to make. And the shepherds bowed down as their bodies began to shake. “You should go to Bethlehem even though it may be far. And away they all went, walking fast as a missile. Where animals were feeding and all lying down. But a baby wrapped in rags with straw up to his ears. They knew in a moment it was the prophesied King. Mary invited them in to hold his sweet little hand. The shepherds wanted to shout and tell all the nations. So they left with their hearts filled and lots of inspiration. This same little baby is today’s reason for Christmas cheer. Invite Him into your heart and you, too, can celebrate Christmas all year. 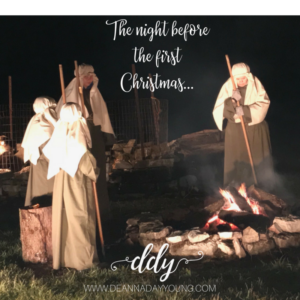 This entry was posted on December 24, 2017 with tags: #jesusisthereasonfortheseason, #makeadifferenceeveryday, #twasthenightbeforechristmas, christmas, Jesus by Deanna Young.